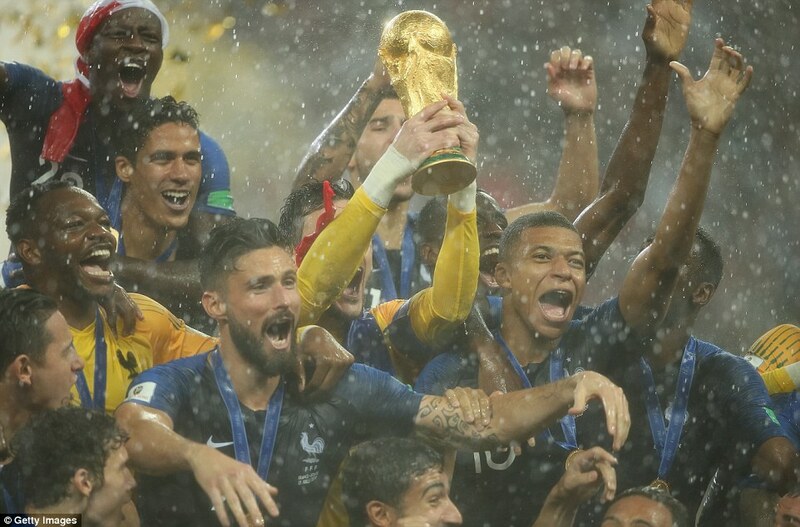 France lifted the World Cup trophy for the second time in their history in a rain-drenched Moscow as the heavens opened during their presentation to leave the players, officials and political dignitaries soaked to the bone. 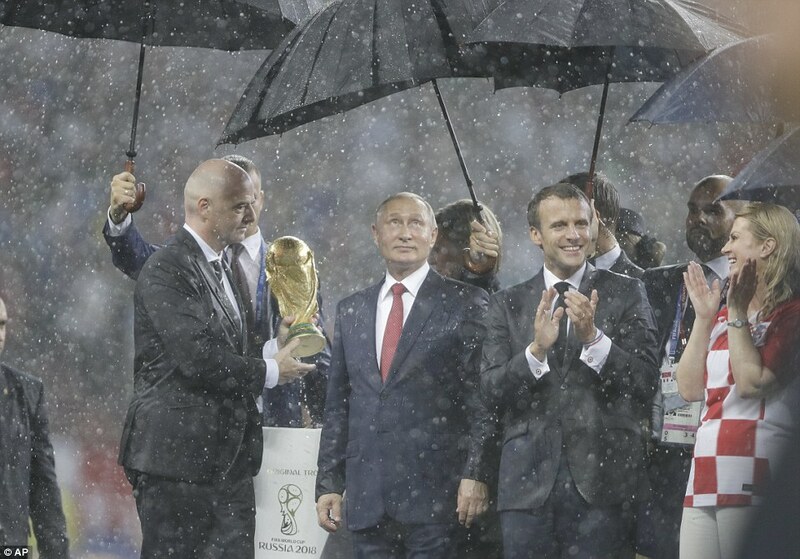 Russia president Vladimir Putin was the only one to keep dry as he had an assistant at the ready with an umbrella. 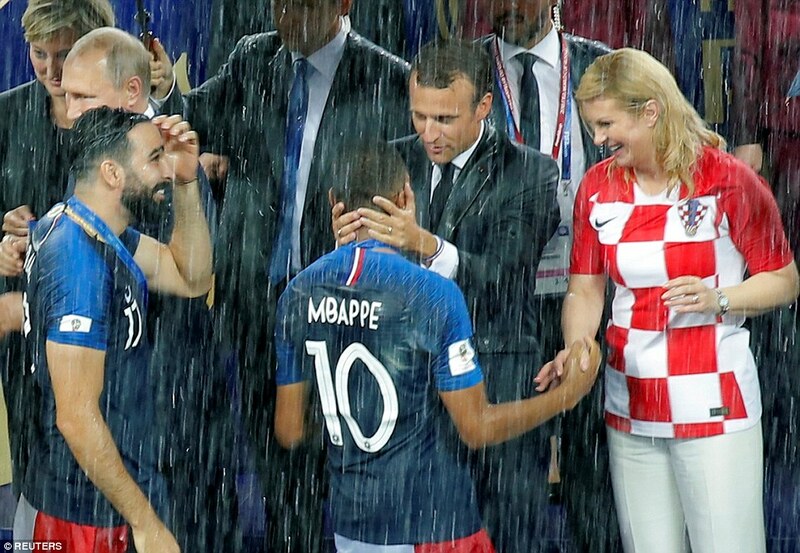 The same could not be said for his counterparts from France and Croatia, Emmanuel Macron and Kolinda Grabar-Kitarovic respectively, who both left the podium sodden. The players did not stop there, however. 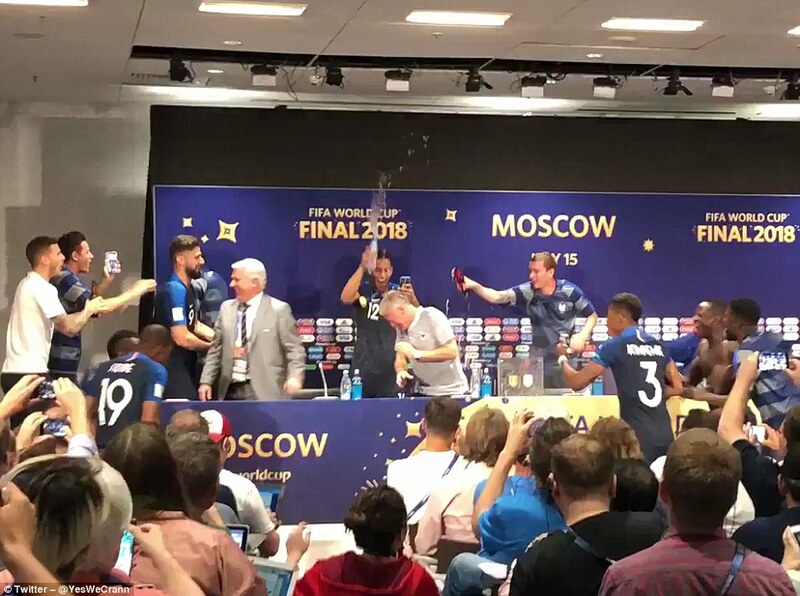 Just when all appeared to have settled down and Didier Deschamps took to his post-match interview duties, the French squad gatecrashed the press conference before drowning their manager in alcohol and chanting his name as the euphoric celebrations continued. 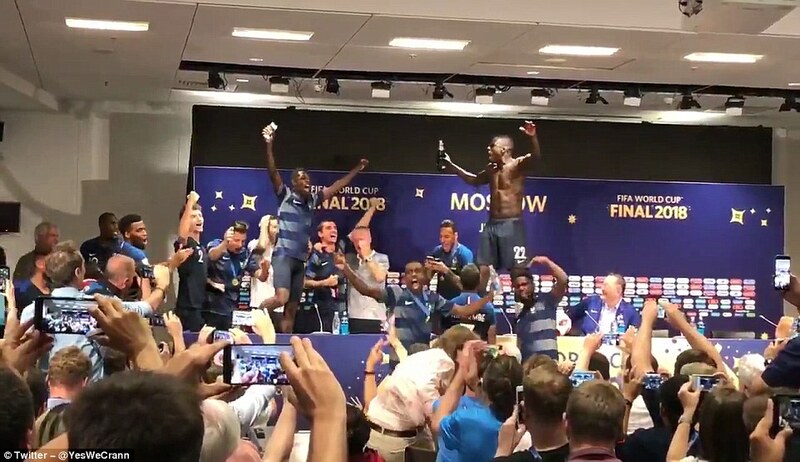 Earlier, the heavy rain did nothing to dampen celebrations as the French players performed swan-dives on the water-logged pitch as they passed around the golden trophy in front of the world's media. 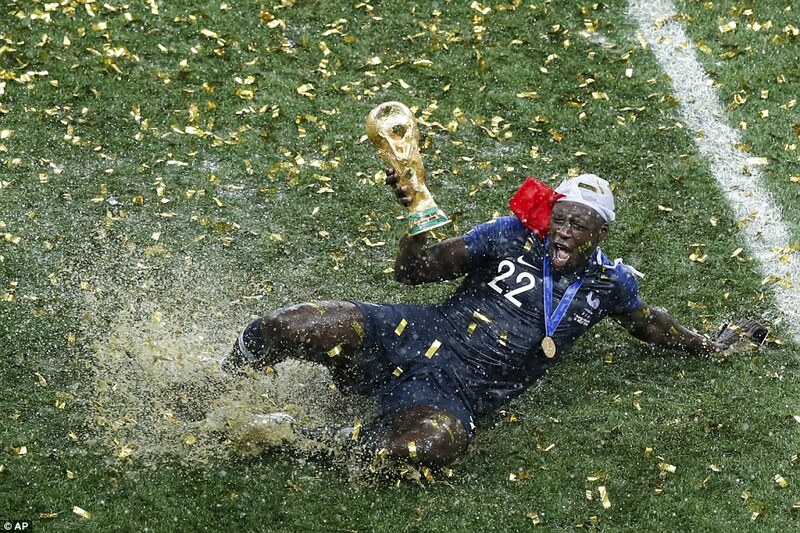 Benjamin Mendy was the first to make use of the rain, sliding with the World Cup in hand towards lucky photographers. 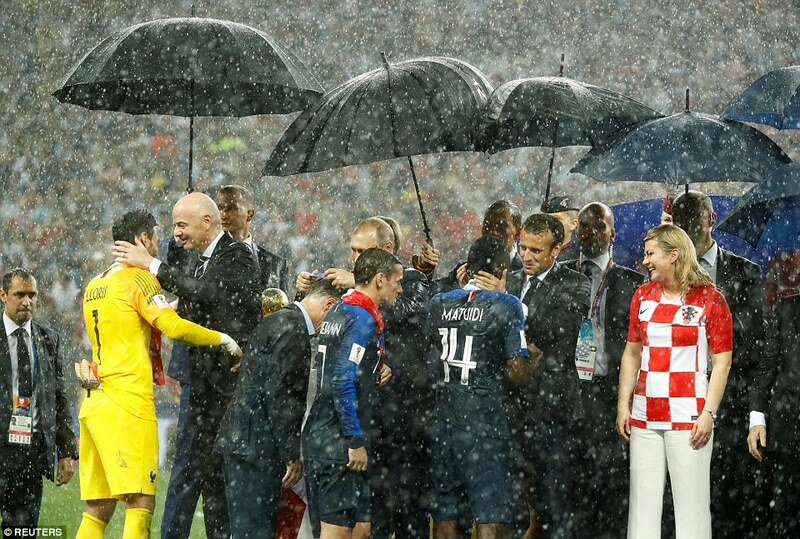 The flash storm came down just as the France players were getting set to step onto the podium, giving the losing Croatia stars the chance to run back to the dressing room. 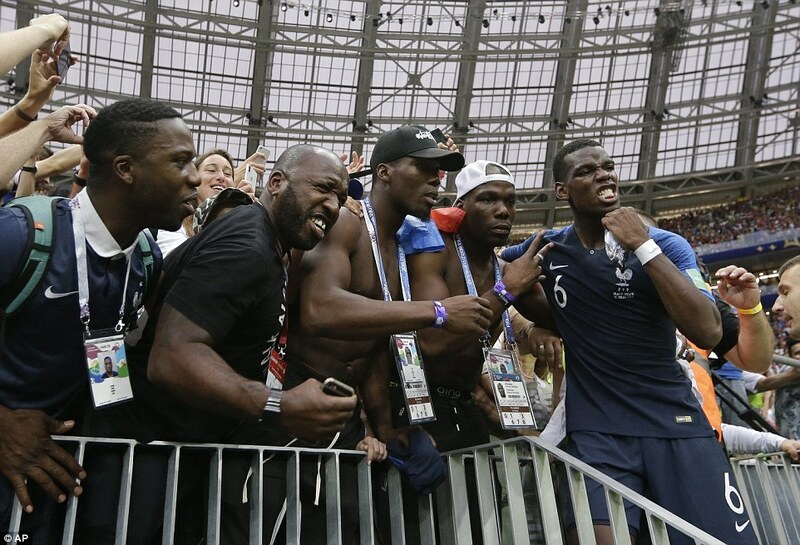 Before then, France had tried to create some thunder of their own with the travelling fans. 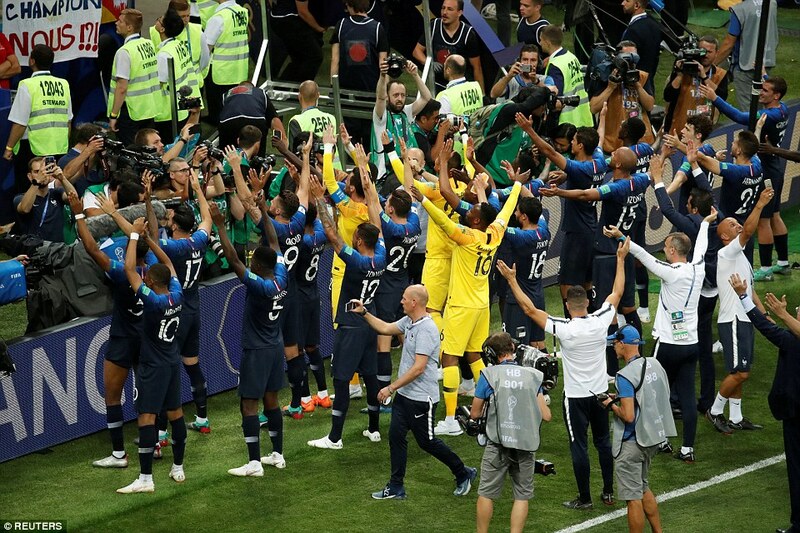 Inspired by Iceland, who exited the World Cup at the group stage, France players orchestrated a 'Thunder Clap' with their fans. 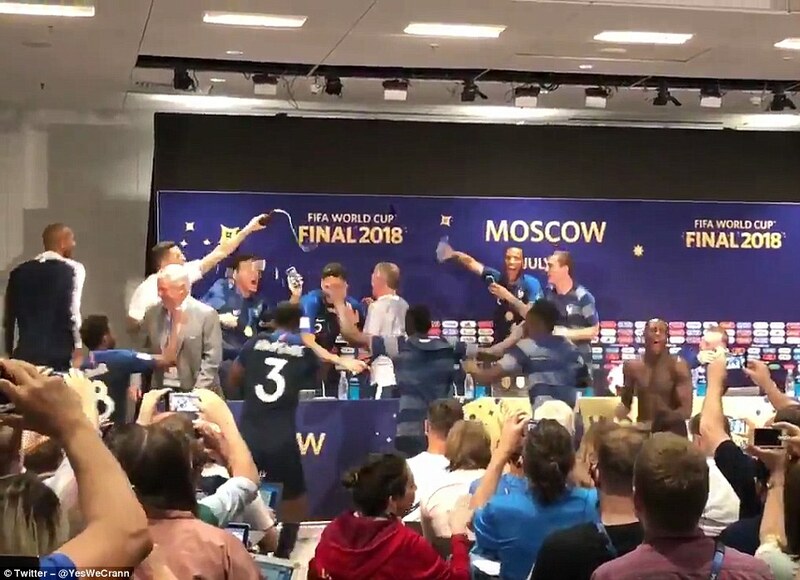 Made famous by the Icelandics on their run to the Euro 2016 quarter-finals, the Thunder Clap involves a series of quickening claps and chants. 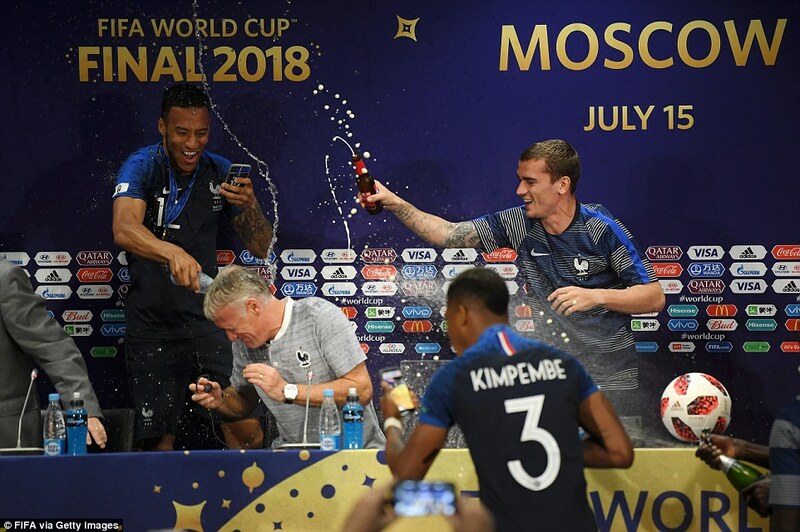 It was a good effort from the French players, but it was difficult to conduct without the man with the drum, who usually dictates the tempo of the claps for the mid-Atlantic island nation. 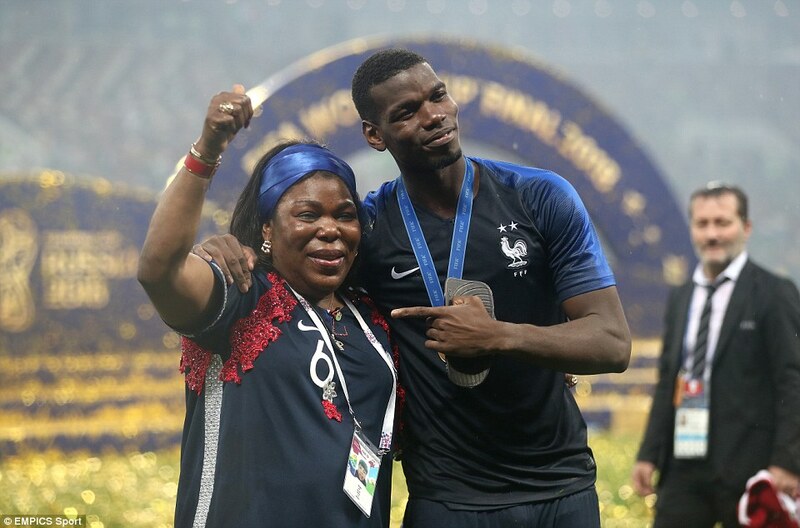 Meanwhile, Pogba continued to present himself as a family man as he made a beeline for his mother and two brothers, eventually plucking them from the crowd so they could celebrate with him on the pitch. 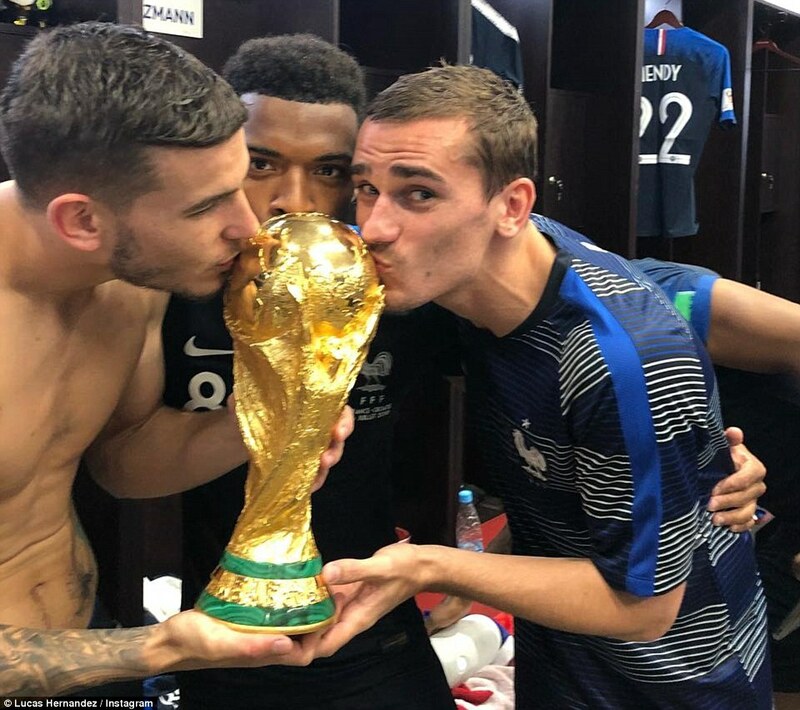 They were even given the chance to hold the trophy itself with Florentin and Mathias taking the chance to kiss it. 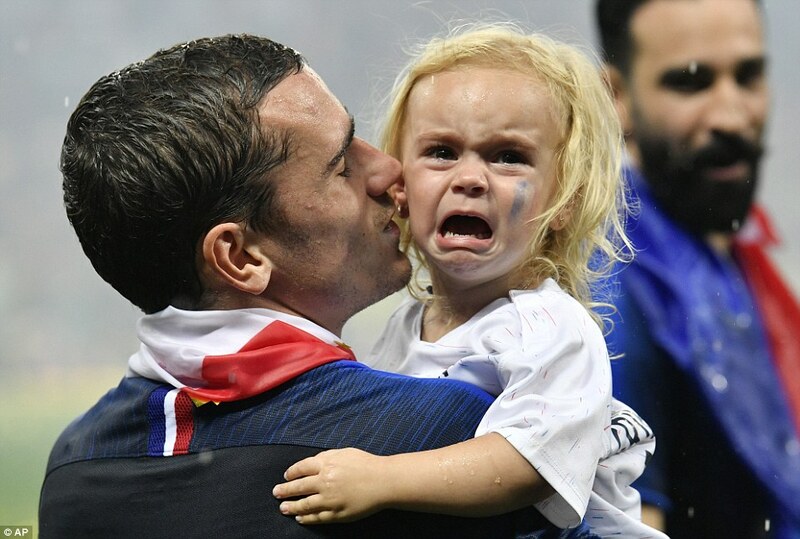 There was a touching moment when Griezmann brought his young daughter, Mia, onto the pitch only for her to quickly become overwhelmed by the excitement and burst into tears. If only she was old enough to understand what a contribution her father had made to the match. 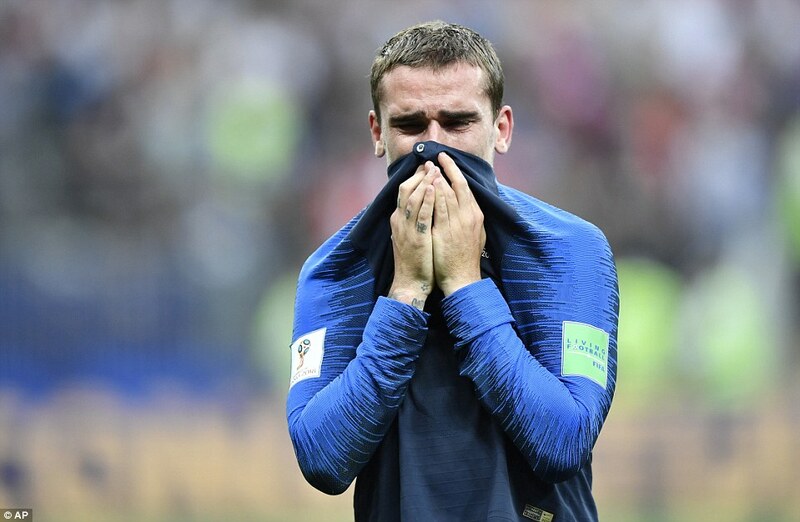 Griezmann, who was left in tears at full-time, said: 'I don't know where I am, it is great... Very happy. It was a difficult match. Croatia play a great game. 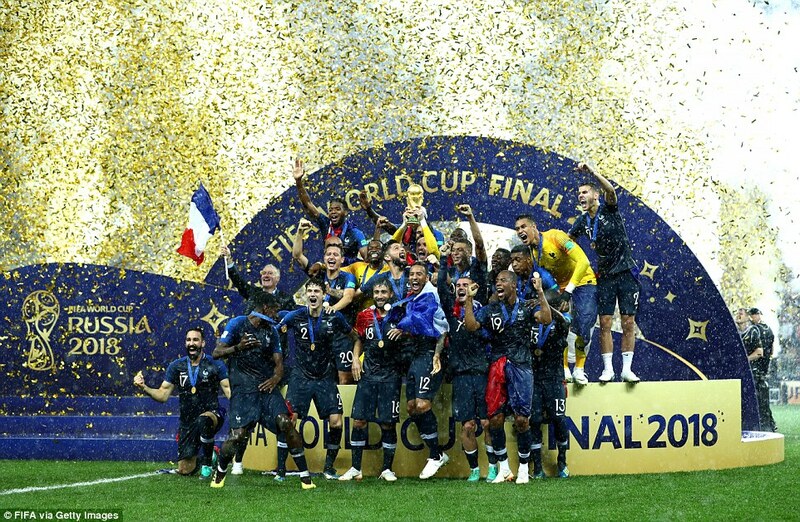 France were the dominant force in an entertaining final, scoring two goals in either half to seal a 4-2 victory at the Luzhniki Stadium in Moscow. 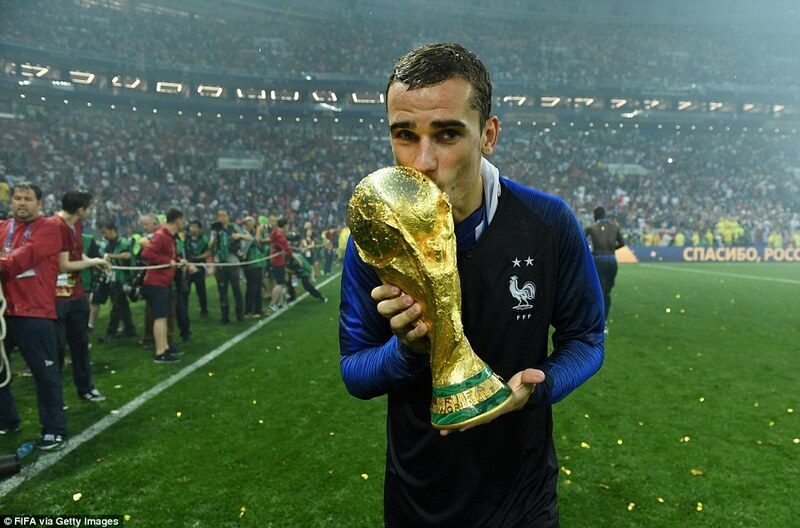 An own goal from Mario Mandzukic and a penalty from Griezmann put Les Bleus 2-1 ahead at half time with Ivan Perisic scoring a fine goal for the underdogs. 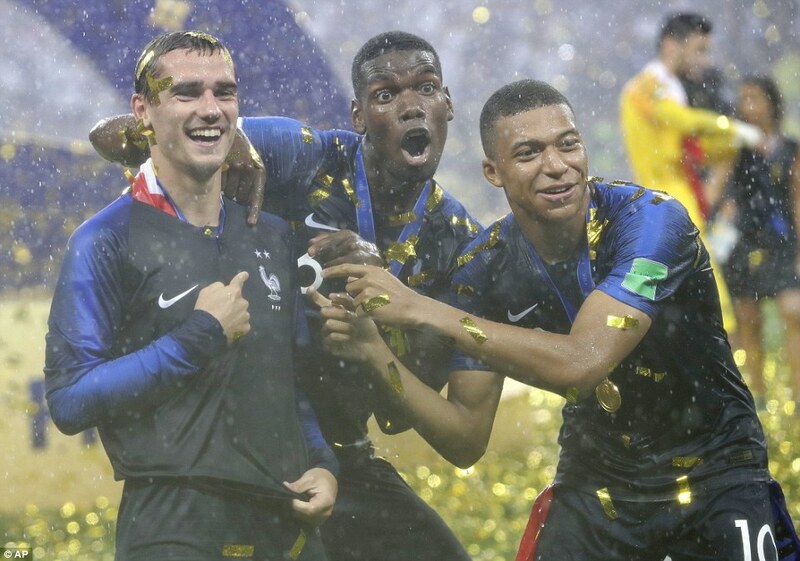 Paul Pogba and Kylian Mbappe sealed the victory with goals in the second before Mandzukic made up for his own goal with one at the right end. However, it would prove to be a mere consolation. 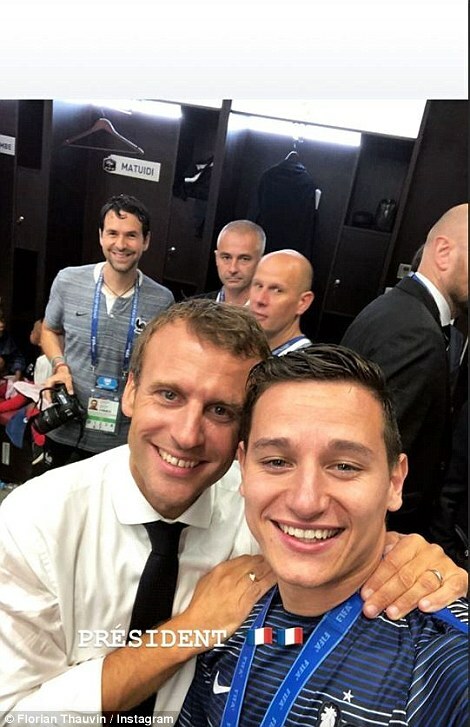 Celebrations continued in the dressing room with French president Macron invited to join the festivities. 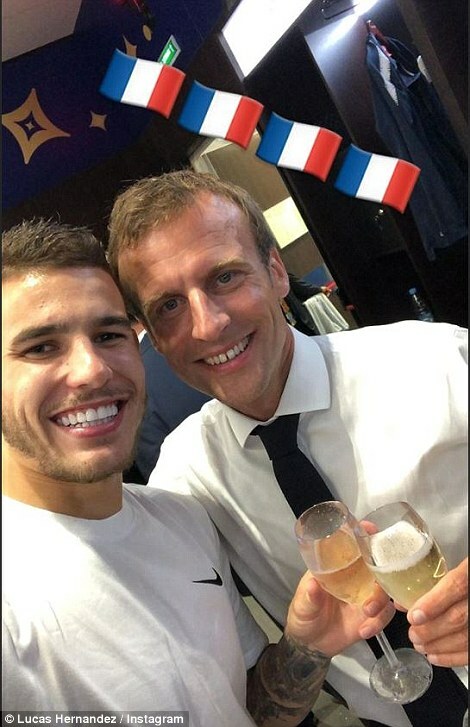 Fittingly, bottles of the country's most famous export, champagne, were plentiful and the players shared a glass with the political leader. 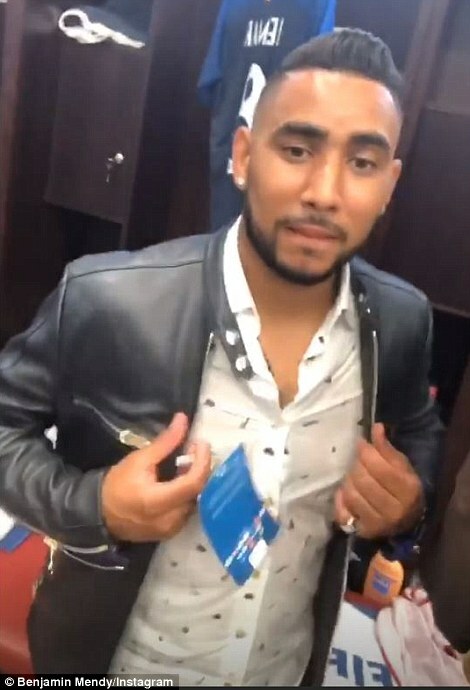 There was also room for Dimitri Payet, who was cruelly ruled out of the World Cup after suffering a thigh injury in Marseille's Europa League final defeat by Atletico Madrid. 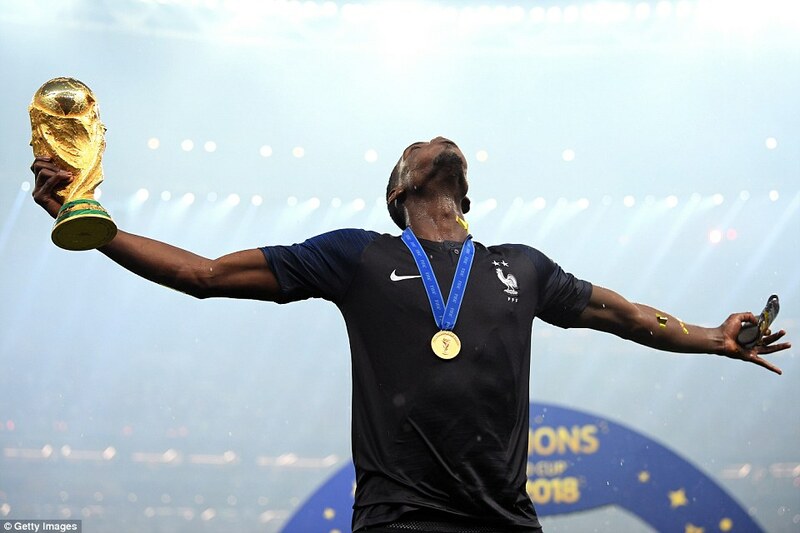 He remains a popular member of the squad, however, and was given the chance to soak up the team's success. 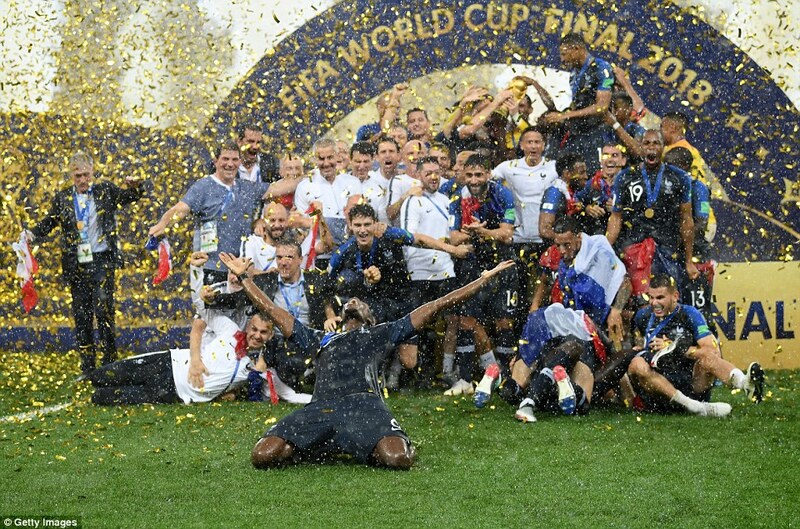 Speaking after their victory, head coach Didier Deschamps said: 'It is really beautiful. It is marvellous. We did not play a great match but we showed a strong mental quality. 'It's a young team, who are on the top of the world. 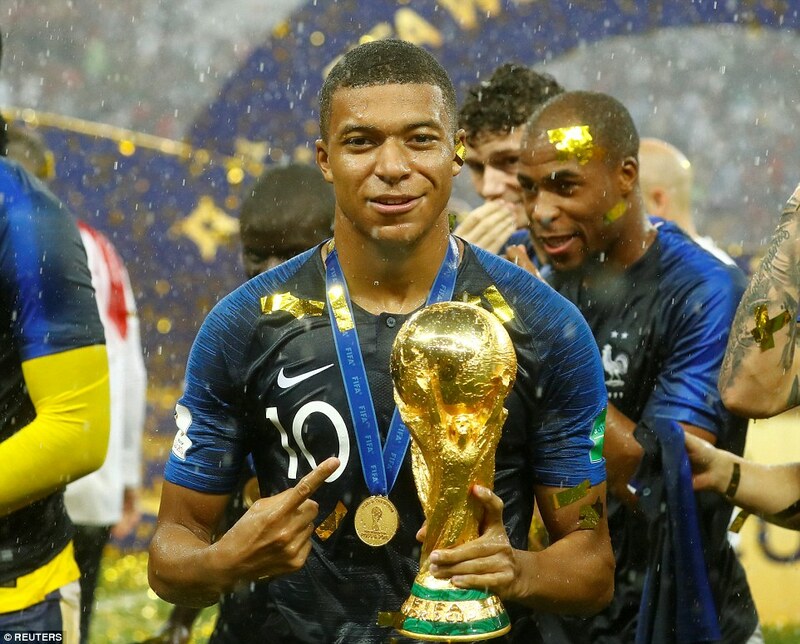 Some are champions at the age of 19. We did not play a huge game but we showed mental quality. 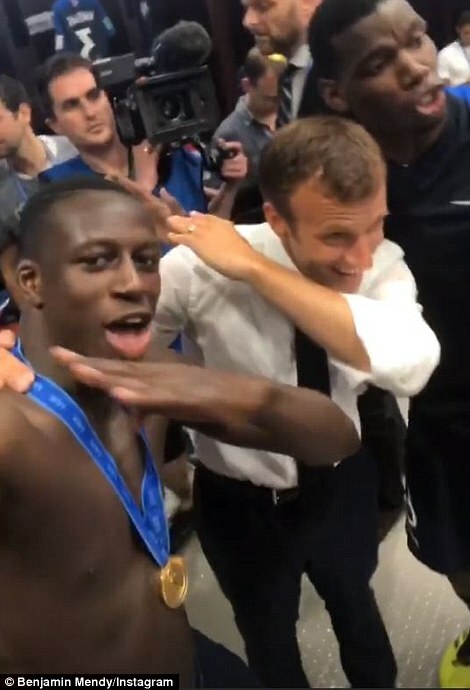 And we scored four goals anyway. 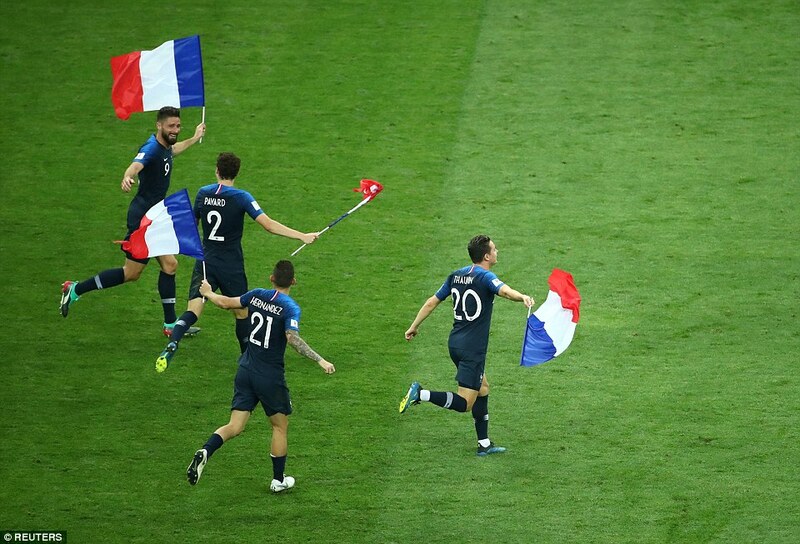 They deserved to win. 'The group worked so hard and we had some tough moments along the way. 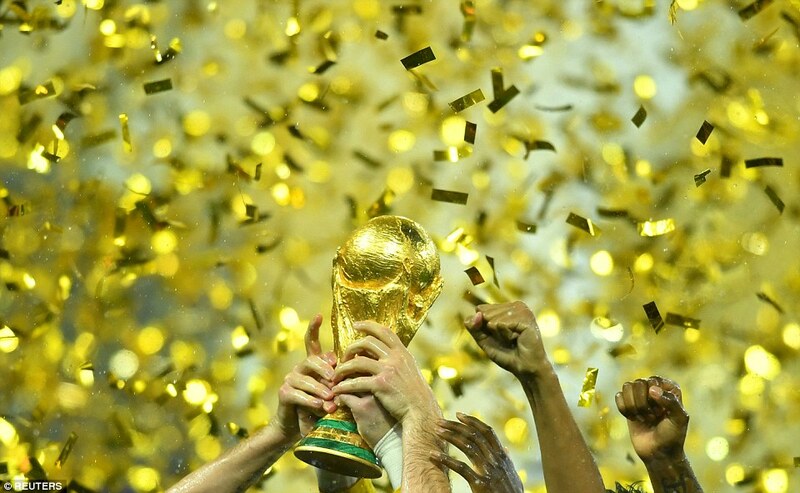 It hurt so much to lose the Euro two years ago, but it made us learn too. The win is not about me, it's the players who won the game. 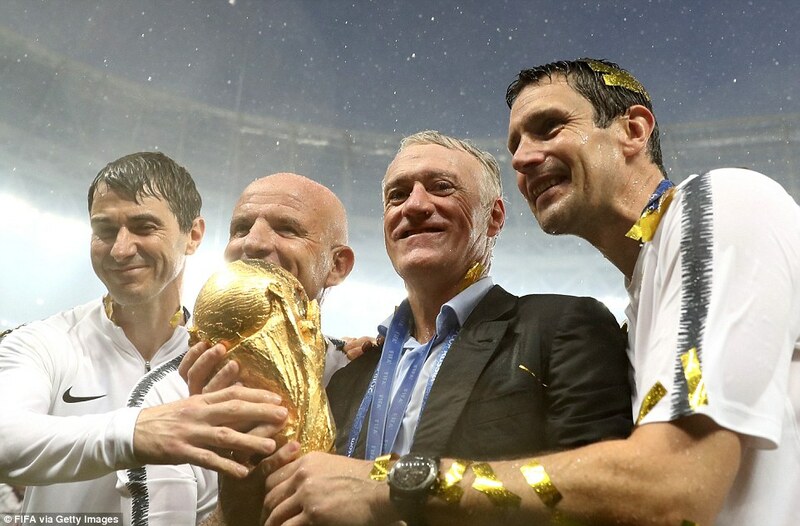 Deschamps became only the second man to captain and coach a side to World Cup glory. 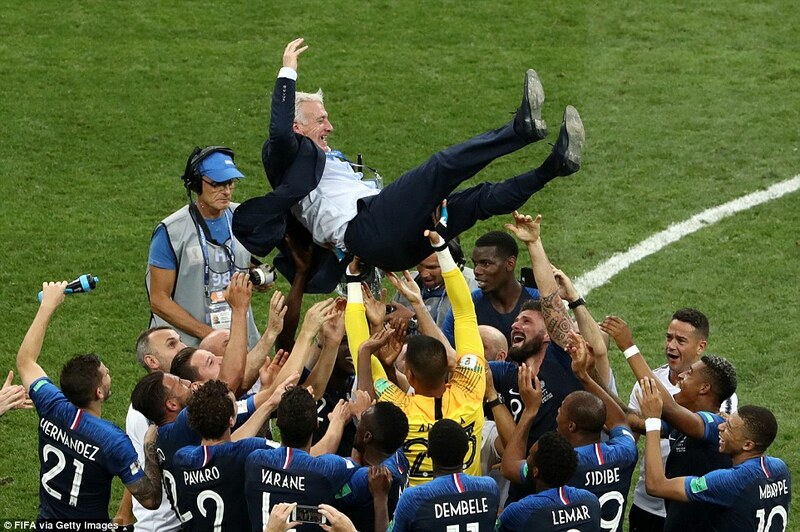 The France manager lifted the trophy as skipper in Paris 20 years ago and only Franz Beckenbauer, captain of a triumphant West Germany in 1974 and then their coach in 1990, has achieved the feat before. He had a talented side at his disposal as he rekindled the glory days of 1998, although he had insisted before the game the two teams could not be compared. 'You can't make comparisons, you can't talk about players from 20 years ago,' he said. 'I am here to write a new page in history, the most beautiful page.